As newcomers to Womex (it was only our second attendance), we are slowly getting to know how it works. Let’s keep a fresh eye in there and explain what has happened last week in Budapest, supposing you’re not an expert of the music ecosystem. Ecosystem is definitely the right word. There is an incredible variety of people out there. Musicians, DJs, radio hosts, media of any kind, promoters, bookers, festivals, labels, publishers, PR… it’s not easy, at first glance, to see how such a population can interact. Some of them have stands to promote their activities, some play at showcases happening day and night, some take part to conferences, some try to grab attention as much as they can, some are paid by a big company or a public organization and just wait for the drinks and showcases to start. So what’s happening when you meet someone? First, you find a common language. Then, you try to introduce yourself and get to know what the other one does here. If you’re lucky, you may find something interesting to develop together. Generally it doesn’t happen immediately, so it’s better to know who you want to meet before you get there. And that’s the point: make new contacts out of nowhere at Womex is quite difficult. It’s way more effective if you have some people to meet there before you go. That’s how it works: you meet IRL some people that you were already in touch with, so that you can go further into the business chat and see how comfortable you feel with the other – basically, see how big his stand and posters are so that you can evaluate his truthworthiness. Which is actually the way it works also in a lot of other sectors of the economy and in 99% of fairs worldwide. 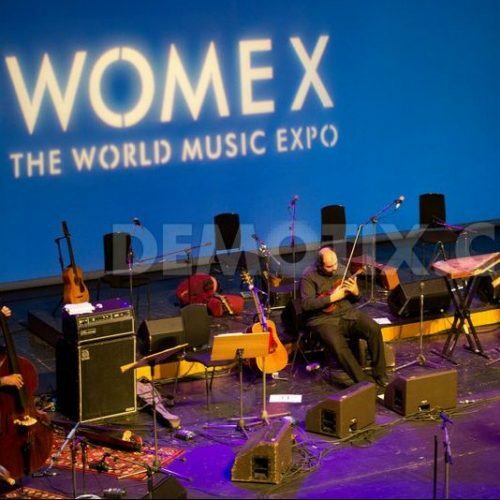 Womex means World Music Expo, so it’s about world / folkloric / traditional (call it as you want) music of course. There is no selection to get there – as long as you pay your accreditation – so all kinds of music are actually welcome, but conferences and showcases stick to world music. This way of governance gives a large interpretation of what world music should be, which is actually good. And since showcases are selected by a jury that changes every year, checking out who is playing on stage or leading a talk at Womex is quite interesting about the scene. We’ll focus here about the showcases as we couldn’t attend the conferences (our bad). If you just check out which countries are represented out there, you would say it’s rather well-balanced. It looks like every part of the world has at least one artist (with a little advantage for Hungary as it was the country who was organising this year). 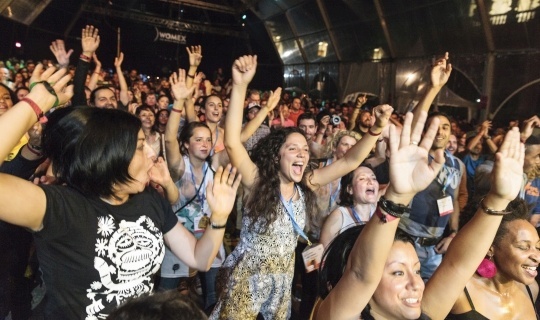 This has to result from a choice as there are probably more applications coming from European artists (or Europe-based artists) than from other continents: Womex takes place in Europe since its creation – more than 20 years ago – and is not able to pay for artists’ performance and transportation costs. If you are selected, it means that you will have the opportunity to play in good conditions in front of bookers and media from all over the world. Of course, there are some spots that are better than the others (not too early – not too late), but generally the audience is here and enthusiastic, and there are other occasions at Womex to promote your music: printed communication, interviews, meetings… anyway, having a showcase doesn’t mean instant success worldwide: it is just another (very) good tool in your development plan. We did not attend all the showcases (they take place at same time) but it looks like the 3 first categories were equally represented at showcases – DJs & producers played in club A38 during the nights. Here again, it’s probably a will of Womex event to have a good balance in the wide variety of instrumentations. Now that we explained a bit how it works, let’s make some remarks of our own. Again, since the selection is made by a jury, this shows interesting facts about the scene and the way it evolves over time – not about Womex as an organization itself. And a lot of those remarks also apply to other fairs worldwide (Babel Med, SXSW…). Just a few examples: there was contemporary jazz artists, pop artists, electronic artists and even rock and punk bands. Sometimes the use of a traditional instrument or the language being used is the only link to world music. Some jazz showcases had a really tiny link to world music. And there were no reggae music, which is a bit odd considering its heavy weight in the market. Of course, in our opinion it is a good thing that world music gets out of museums, and that more and more artists tend to make their own world music (or music from their own world, we would say). But there is a risk that some artists just use the fact they are born in – or living in – a remote country, even if they actually live in Europe, or include an accordion sample somewhere, to be able to promote music that could easily defined as « rock », « jazz » or « pop » otherwise. And there is already hundreds of rock, jazz and pop events worldwide. Anyway it’s the scene’s own responsibility to teach the difference between african music and pop music sung in an african language, or between balkan music and jazz music with just a balkan instrument in the orchestra. Due to Womex location, artists that are able to come from really far to perform are those that are able to raise enough money in their own country to do it. Artists from far away have to gain support from the local music system behind them, whereas a band from Europe may just have an indie label and booker and here they are. It is complicated for a band to actively tour in a remote region, with or without having a Womex showcase. By preserving the balance between the countries, Womex somehow wants to ignore this fact, but in the end it’s still going to be complicated for a Chinese band to tour in Europe, or for a French band to tour in South America. Maybe the event could focus a bit less on live shows and start to deal more and more with the labels’ and publishers’ work, so that music can spread. That’s probably what the Label Award stands for, even if only based on the airplays on biggest radios right now. There also the initiative of the Global Club Music Network to produce remixes compilations of showcased-artists tracks by non-showcased-artists in order to facilitate music exchanges, as putting on shows and tours remain difficult. Womex publishes a compilation of selected artists: we could imagine another Womex compilation of selected artists who don’t play live: after all, recorded music is the first ambassador of musical creation, isn’t it? This also leads to some strategic choices, such as hiring a backing band based in Europe if the main artist comes from South America or Asia or wherever. Or having backtracks with traditional instruments in it – and an additional live drummer & bass player to look like a proper band. 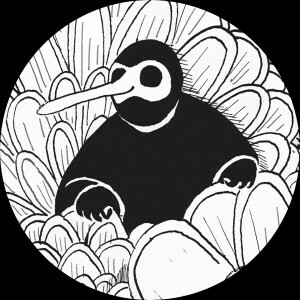 It is highly positive that mixity is encouraged in artistic teams, even if it’s for simple economic reasons. Of course, some bands look as if they didn’t knew each other the month before, and you can hear it if you’re a music lover. But give them a few months and it’s probably going to be quite fine. … but new artists have a different approach. New bands know best how to get your attention with the use of social media and live show technology. Some showcases looked like a calibrated performance with experienced musicians, a great single, nice visuals, all with a fresh new name and a first album already on heavy rotation. And you want to see them because it’s maybe the next big thing. After all, nothing is more boring that an artist that has made four studio albums and didn’t succeed yet. This is just like in any music style, you would say. Thing is, industrial music hasn’t always been so much inspired by world music. Globalization brought success stories of world-music influenced industrial artists that led the way to a generation that knows how to mix old industrial recipes with just a little spicy folkloric flavour. Let’s keep it positive: these artists can bring new listeners to our scene – we need everyone! Of course, there are maybe hundreds of Europe-based artists applying versus maybe five or six from this-country-you-never-heard-of-before – especially since transportation costs make a selection. And since Womex needs artists from everywhere, they may get selected anyway – which is nice: we love to see music from those remote countries, that is what Womex stands for obviously. The problem is, some bands have less transportation costs, and thus definitely a higher tour & management budget that the others, and you see it on stage. They bring their technicians, they sound better and they have better lights and videos. So the average booker from a European festival may think something like « It would be nice to have a Chinese band this year, but their show was horrible. Let’s stick to this European one – after all, they have an chinese singer. Or at least he looks like he’s from China. » Which is pretty much what will happen, if you check the line-up of festivals next summer. This is inherent to the market of live music – unless you try to fix a maximum budget for each selected artist, which may sound weird. That’s another reason why world music fairs should make a bigger place for recorded music. As a conclusion, we just wanted to say that we loved this Finnish band and, let’s face it, the fact that they play great Balkan music even if they are not from the Balkans themselves. That’s not happening so often and we hope there will be more and more artists good enough to be selected to play music from anywhere on Earth! See you at next fair! NB: There are two reasons why we don’t tell the names of the showcases we (gently) criticized in here. Firstly, we are all in the same scene: if we might have one common enemy, then it’ll be industrial music and nothing else. Secondly, all our remarks are based on what we saw and felt, so it’s by definition subject to interpretation and mistakes.